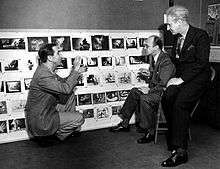 Stokowski conducted the music for and appeared in several Hollywood films, including Disney's Fantasia, and was a lifelong champion of contemporary composers, giving many premieres of new music during his 60-year conducting career. 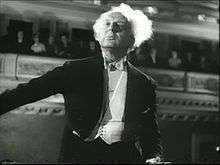 Stokowski, who made his official conducting debut in 1909, appeared in public for the last time in 1975 but continued making recordings until June 1977, a few months before his death at the age of 95. 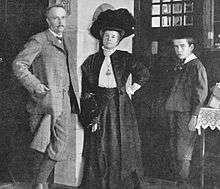 The son of an English-born cabinet-maker of Polish heritage, Kopernik Joseph Boleslaw Stokowski, and his Irish-born wife Annie-Marion (née Moore), Stokowski was born Leopold Anthony Stokowski, although on occasion in later life he altered his middle name to Antoni, per the Polish spelling. There is some mystery surrounding his early life. For example, he spoke with an unusual, non-British accent, though he was born and raised in London. On occasion, Stokowski gave his year of birth as 1887 instead of 1882, as in a letter to the Hugo Riemann Musiklexicon in 1950, which also incorrectly gave his birthplace as Kraków, Poland. Nicolas Slonimsky, editor of Baker's Biographical Dictionary of Musicians, received a letter from a Finnish encyclopaedia editor that said, "The Maestro himself told me that he was born in Pomerania, Germany, in 1889." In Germany there was a corresponding rumour that his original name was simply "Stock" (German for stick). However, Stokowski's birth certificate (signed by J. Claxton, the registrar at the General Office, Somerset House, London, in the parish of All Souls, County of Middlesex) gives his birth on 18 April 1882, at 13 Upper Marylebone Street (now New Cavendish Street), in the Marylebone District of London. Stokowski was named after his Polish-born grandfather Leopold, who died in the English county of Surrey on 13 January 1879, at the age of 49. 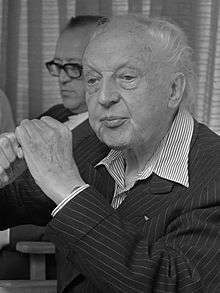 The "mystery" surrounding his origins and accent is clarified in Oliver Daniel's 1000-page biography Stokowski – A Counterpoint of View (1982), in which (in Chapter 12) Daniel reveals Stokowski came under the influence of his first wife, pianist Olga Samaroff. Samaroff, born Lucy Mary Agnes Hickenlooper, was from Galveston, Texas, and adopted a more exotic-sounding name to further her career. For professional and career reasons, she "urged him to emphasize only the Polish part of his background" once he became a resident of the United States. He studied at the Royal College of Music, where he first enrolled in 1896 at the age of thirteen, making him one of the youngest students to do so. In his later life in the US, Stokowski would perform six of the nine symphonies composed by his fellow organ student Ralph Vaughan Williams. Stokowski sang in the choir of the St Marylebone Parish Church, and later he became the Assistant organist to Sir Walford Davies at The Temple Church. By age 16, Stokowski was elected to a membership in the Royal College of Organists. In 1900, Stokowski formed the choir of St. Mary's Church, Charing Cross Road, where he trained the choirboys and played the organ. In 1902, Stokowski was appointed the organist and choir director of St. James's Church, Piccadilly. 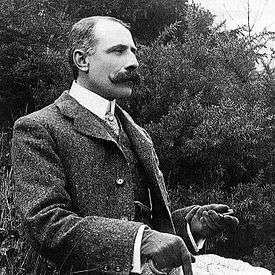 He also attended The Queen's College, Oxford, where he earned a Bachelor of Music degree in 1903. Stokowski rapidly gained a reputation as a musical showman. His flair for the theatrical included grand gestures such as throwing the sheet music on the floor to show he did not need to conduct from a score. He also experimented with new lighting arrangements in the concert hall, at one point conducting in a dark hall with only his head and hands lighted, at other times arranging the lights so they would cast theatrical shadows of his head and hands. Late in the 1929-30 symphony season, Stokowski started conducting without a baton. His free-hand manner of conducting soon became one of his trademarks. On the musical side, Stokowski nurtured the orchestra and shaped the "Stokowski" sound, or what became known as the "Philadelphia Sound". He encouraged "free bowing" from the string section, "free breathing" from the brass section, and continually altered the seating arrangements of the orchestra's sections, as well as the acoustics of the hall, in response to his urge to create a better sound. 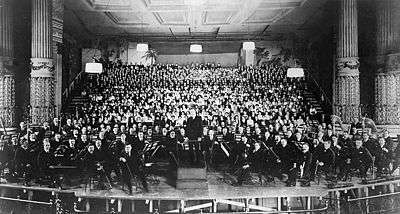 Stokowski is credited as the first conductor to adopt the seating plan that is used by most orchestras today, with first and second violins together on the conductor's left, and the violas and cellos to the right. (Preben Opperby's 1982 Stokowski biography reproduces, on page 127, four of Stokowski's various seating plans, of which illustration No. 2 shows the string sections as here described). Stokowski's repertoire was broad and included many contemporary works. He was the only conductor to perform all of Arnold Schoenberg's orchestral works during the composer's own lifetime, several of which were world premieres. Stokowski gave the first American performance of Schoenberg's Gurre-Lieder in 1932. It was recorded "live" on 78 rpm records and remained the only recording of this work in the catalogue until the advent of the LP album. Stokowski also presented the American premieres of four of Dmitri Shostakovich's symphonies, Numbers 1, 3, 6, and 11. In 1916, Stokowski conducted the American premiere of Mahler's 8th Symphony, Symphony of a Thousand. He added works by Rachmaninoff to his repertoire, giving the world premieres of his Fourth Piano Concerto, the Three Russian Songs, the Third Symphony, and the Rhapsody on a Theme of Paganini; Sibelius, whose last three symphonies were given their American premieres in Philadelphia in the 1920s; and Igor Stravinsky, many of whose works were also given their first American performances by Stokowski. In 1922, he introduced Stravinsky's score for the ballet The Rite of Spring to America, gave its first staged performance there in 1930 with Martha Graham dancing the part of The Chosen One, and at the same time made the first American recording of the work. With his Philadelphia Orchestra contract having expired in 1940, Stokowski immediately formed the All-American Youth Orchestra, its players' ages ranging from 18 to 25. It toured South America in 1940 and North America in 1941 and was met with rave reviews. Although Stokowski made a number of recordings with the AAYO for Columbia, the technical standard was not as high as had been achieved with the Philadelphia Orchestra for RCA Victor. In any event, the AAYO was disbanded when America entered the war, and plans for another extensive tour in 1942 were abandoned. Stokowski returned to the NBC Symphony Orchestra in 1954 for a series of recording sessions for RCA. The repertoire included Beethoven's 'Pastoral' Symphony, Sibelius's 2nd Symphony, Acts 2 and 3 of Tchaikovsky's Swan Lake and highlights from Saint-Saëns's Samson and Delilah with Risë Stevens and Jan Peerce. After the NBC Symphony Orchestra was disbanded as the official ensemble of the NBC radio network, it was re-formed as the Symphony of the Air with Stokowski as notional Music Director, and as such performed many concerts and made recordings from 1954 until 1963. The US premiere in 1958 of Turkish composer Adnan Saygun's Yunus Emre Oratorio is among them. He made a series of Symphony of the Air recordings for the United Artists label in 1958 which included Beethoven's 7th Symphony, Shostakovich's 1st Symphony, Khatchaturian's 2nd Symphony and Respighi's The Pines of Rome. From 1955 to 1961, Stokowski was also the Music Director of the Houston Symphony Orchestra. For his debut appearance with the orchestra he gave the first performance of Mysterious Mountain by Alan Hovhaness – one of many living American composers whose music he championed over the years. He also gave the US premiere in Houston of Shostakovich's 11th Symphony (7 April 1958) and made its first American recording on the Capitol label. Stokowski gave his last world premiere in 1973 when, at the age of 91, he conducted Havergal Brian's 28th Symphony in a BBC radio broadcast with the New Philharmonia Orchestra. In August 1973, Stokowski conducted the International Festival Youth Orchestra at Royal Albert Hall in London, performing Tchaikovsky's Fifth Symphony. Edward Greenfield of The Guardian wrote: "Stokowski rallied them as though it was a vintage Philadelphia concert of the 1920s". Stokowski continued to make recordings even after he had retired from the concert platform, mainly with the National Philharmonic, another 'ad hoc' orchestra made up of first-desk players chosen from the main London orchestras. In 1976, he signed a recording contract with CBS Records that would have kept him active until he was 100 years old. Stokowski made the first US recordings of the Beethoven 7th and 9th Symphonies, Antonín Dvořák's New World Symphony, Tchaikovsky's 4th Symphony and Nutcracker Suite, César Franck's Symphony in D minor, Rimsky-Korsakov's Scheherazade, Rachmaninoff's 2nd Piano Concerto (with the composer as soloist), Sibelius's 4th Symphony (its first recording), Shostakovich's 5th and 6th Symphonies, and many shorter works. His early recordings were made at Victor's Trinity Church studio in Camden, New Jersey until 1926, when Victor began recording the orchestra in the Academy of Music in Philadelphia. Stokowski and the Philadelphia Orchestra later participated in long playing, high fidelity, and stereophonic experiments, during the early 1930s, mostly for Bell Laboratories. (Victor even released some early LPs at this time, which were not commercially successful because they required special, expensive phonographs that most people could not afford during the Great Depression.) Stokowski continued to make recordings with the Philadelphia Orchestra, for RCA Victor, through December 1940. One of his last 1940 sessions was the world premiere recording of Shostakovich's sixth symphony. Stokowski recorded prodigiously for various labels until shortly before his death, including RCA Victor, Columbia, Capitol, Everest, United Artists, and Decca/London 'Phase 4' Stereo. Other labels for which Stokowski recorded in the late 1950s included Everest, noted for its use of 35 mm film instead of tape and the resulting highly vivid sound. The most notable of which was a coupling of Tchaikovsky's Francesca da Rimini and Hamlet with Stokowski conducting the New York Stadium Symphony Orchestra (the summer name for the New York Philharmonic). Other remarkable Everest's recordings of Stokowski conducting the New York Stadium Symphony Orchestra are Villa-Lobos' tone poem Uirapuru, Shostakovich's Symphony No. 5 and Prokofiev's ballet suite Cinderella. Several of Stokowski's televised concerts have appeared on both Video and DVD, including Beethoven's 5th Symphony and Schubert's Unfinished with the London Philharmonic on EMI Classics 'Classic Archive' label; the Nielsen 2nd Symphony with the Danish Radio Orchestra on VAI (Video Artists International); and the Ives 4th Symphony with the American Symphony Orchestra on Classical Video Rarities. His first wife was American concert pianist Olga Samaroff (born Lucy Hickenlooper), to whom he was married from 1911 until 1923. They had one daughter: Sonya Maria Noel Stokowski (born on December 24, 1921), an actress, who married Willem Thorbecke and settled in the US with their four children, Noel, Johan, Leif and Christine. His second wife was Johnson & Johnson heiress Evangeline Love Brewster Johnson (1897-1990), an artist and aviator, to whom he was married from 1926 until 1937 (two daughters: Gloria Luba Stokowski and Andrea Sadja Stokowski). In March 1938, Stokowski vacationed with Greta Garbo on the island of Capri in Italy. (New York Times March 2, 1938 New York NY) This followed other reports of romance between Stokowski and Garbo. Subsequently, Stokowski and Evangeline were divorced. Evangeline later married Prince Zalstem-Zalessky, a descendant of a Russian noble family who died in 1965, while Evangeline died at age 93 on June 17, 1990. Stokowski's third wife (1945 - 1955) was heiress and actress Gloria Vanderbilt (born 1924), by whom he had two sons, Leopold Stanislaus Stokowski (born 1950) and Christopher Stokowski (born 1952). After he had achieved international fame with the Philadelphia Orchestra, unsubstantiated rumours circulated that he was born "Leonard" or "Lionel Stokes" or that he had "anglicized" it to "Stokes"; this canard is readily disproved by reference not only to his birth certificate and those of his father, younger brother, and sister (which show Stokowski to have been the genuine polonised Lithuanian family name, original 'Stokauskas' where 'stoka' means 'lack or shortage'), but also by the Student Entry Registers of the Royal College of Music, Royal College of Organists, and The Queen's College, Oxford, along with other surviving documentation from his days at St. Marylebone Church, St. James's Church, and St. Bartholomew's in New York City. After Stokowski's death, Tom Burnam writes, the "concatenization of canards" that had arisen around him was revived – that his name and accent were phony; that his musical education was deficient; that his musicians did not respect him; that he cared about nobody but himself. Burnam suggests that there was a dark, hidden reason for these rumours. Stokowski deplored the segregation of symphony orchestras in which women and minorities were excluded, and, so Burnam claims, his detractors got revenge by slandering Stokowski. Nevertheless, and notwithstanding the claims made by Tom Burnam, attitudes towards Stokowski have changed dramatically over the years since his death. In 1999, for Gramophone magazine, the noted music commentator David Mellor wrote: "One of the great joys of recent years for me has been the reassessment of Leopold Stokowski. When I was growing up there was a tendency to disparage the old man as a charlatan. Today it is all very different. Stokowski is now recognised as the father of modern orchestral standards. He possessed a truly magical gift of extracting a burnished sound from both great and second-rank ensembles. He also loved the process of recording and his gramophone career was a constant quest for better recorded sound. But the greatest pleasure of all for me is his acceptance now as an outstanding conductor of nineteenth- and twentieth-century music, including a lot that was at the cutting edge of contemporary achievement." ↑ Simon Callow (23 September 2005). "He would fix the audience with his glinting eye...". The Guardian. Retrieved 11 April 2007. ↑ Smith, Rollin (2004). Stokowski and the Organ. Pendragon Press. p. 17. ↑ David Lasserson (19 July 2002). "Are concerts killing music?". The Guardian. Retrieved 11 April 2007. ↑ David Patrick Stearns (26 January 2007). "Leopold Stokowski, the father of the Philadelphia Sound". Philadelphia Inquirer. Retrieved 11 April 2007. ↑ Schonberg, Harold C. (1967). The Lives of the Great Composers. New York: Simon and Schuster. ISBN 0-393-02146-7. ↑ "Hollywood Bowl Orchestra". Retrieved 1 January 2008. ↑ "History of the Hollywood Bowl". Retrieved 1 January 2008. ↑ Edward Greenfield (13 February 2004). "Mahler: Symphony No. 2, Woodland/ Baker/ BBC Chorus and Choral Soc/ LSO/ Stokowski". The Guardian. Retrieved 11 April 2007. ↑ Paul Vaughan (13 March 2002). "Age cannot wither them". The Guardian. Retrieved 11 April 2007. ↑ East Finchley Cemetery infosite, westminster.gov.uk; accessed 21 July 2014. ↑ Fox, Barry (24–31 December 1981) "A hundred years of stereo: fifty of hi-fi", Scientific American, pp 910–911; retrieved 1 March 2012. ↑ Larry Huffman. "Leopold Stokowski Biography". The Stokowski Legacy. Retrieved November 1, 2016. ↑ Knight, John (1996). "Leopold Stokowski Explores Debussy's Orchestral Colors". The Instrumentalist. 50 (9).